Israeli archeologists unveiled a 2,000-year-old workshop for making stone vessels similar to those Jesus is believed to have used to miraculously turn water into wine. Located near the Galilee village of Reineh in northern Israel, the site is walking distance from Cana, the site of a wedding where the Gospel of John says Jesus performed the miracle, his first. The workshop and an adjoining quarry were discovered by chance during the construction of an access road for a new sports centre, excavation director Yonatan Adler said. Since the discovery two months ago, Adler and his team have uncovered fragments of chalkstone mugs and bowls along with thousands of cylindrical chalk cores discarded in the process of hollowing out the vessels with a lathe. They are typical of a period from the second half of the first century BC to the middle of the first century AD. Jews of the period used stoneware for reasons of religious observance, Adler said. "According to ancient Jewish ritual law, vessels made of pottery are easily made impure and must be broken. Stone, on the other hand, was thought to be a material which can never become ritually impure," he said. That practice was noted in John's New Testament account of the Cana wedding, which described larger vessels: "There were set there six waterpots of stone, after the manner of the purifying of the Jews." "So far at this site we haven't found production of these large jars," Adler said. "But presumably the stone jars that would have been used at Cana would have been produced at a site like this, probably in the area." He said that prior to the Reineh excavation two similar sites had been excavated, both near Jerusalem. 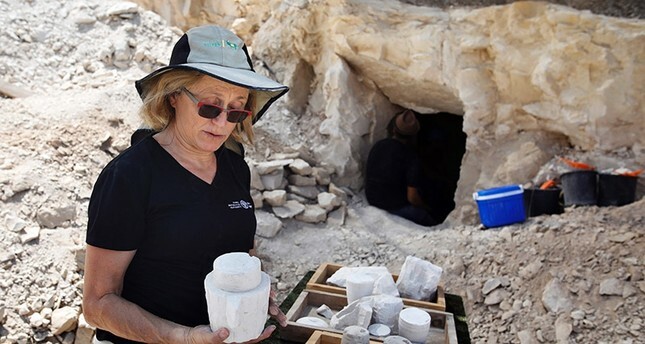 "What's exciting here is that for the first time we have physical evidence of production of stone vessels here in Galilee," he said. "There has always been a question amongst scholars regarding the nature of Judaism in Galilee," something particularly important when studying early Christianity, he said. "The question is, who are these people that are living in Galilee?"